Η θερμοπηξία με μικροκύματα γίνεται με υψηλής ταχύτητας (2450 MHz) μικροκύματα παραγόμενα από μήλη. 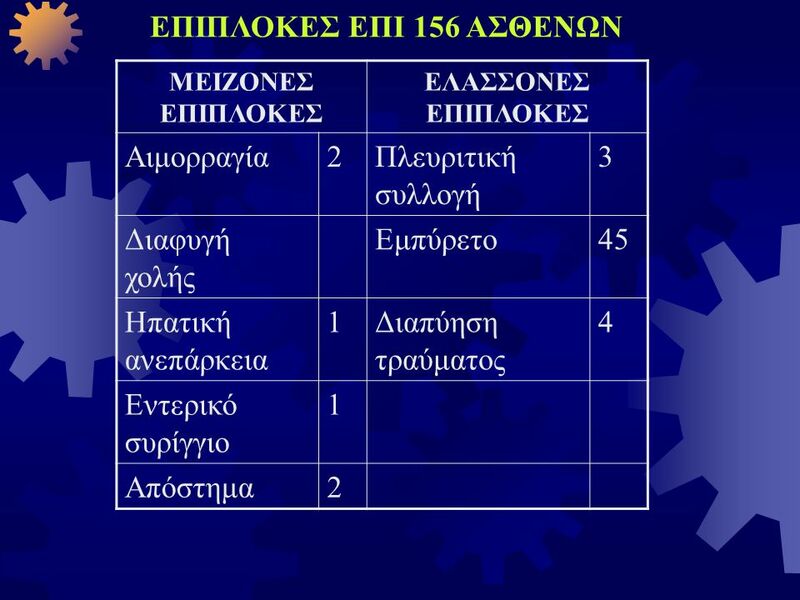 Οι ασθενείς αυτοί υποβάλλονται σε καταστροφή του καρκίνου τους είτε με εγχείρηση λαπαροσκόπηση καθοδήγηση από αξονικό τομογράφο. 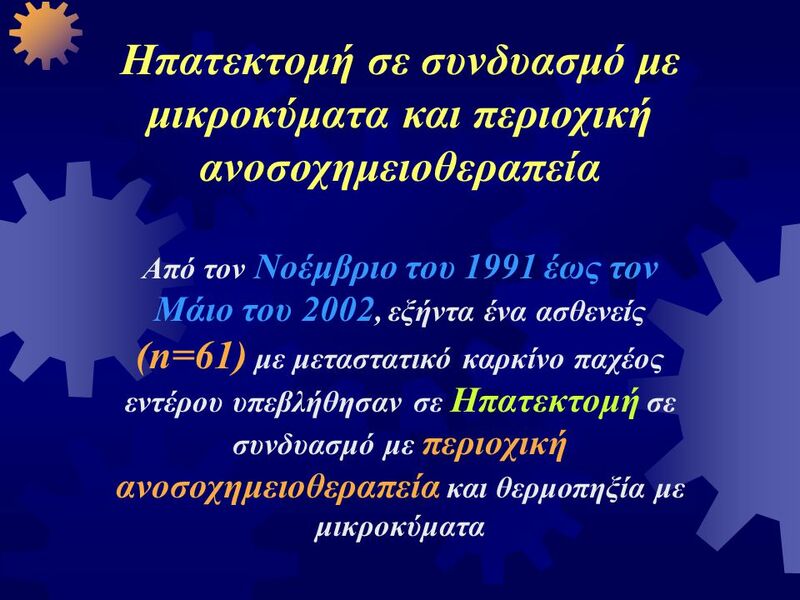 Τα μικροκύματα χρησιμοποιούνται σήμερα και κατά τη διάρκεια ηπατεκτομής, για καταστροφή εστιών που αφορούν τα εναπομείναντα τμήματα ήπατος. 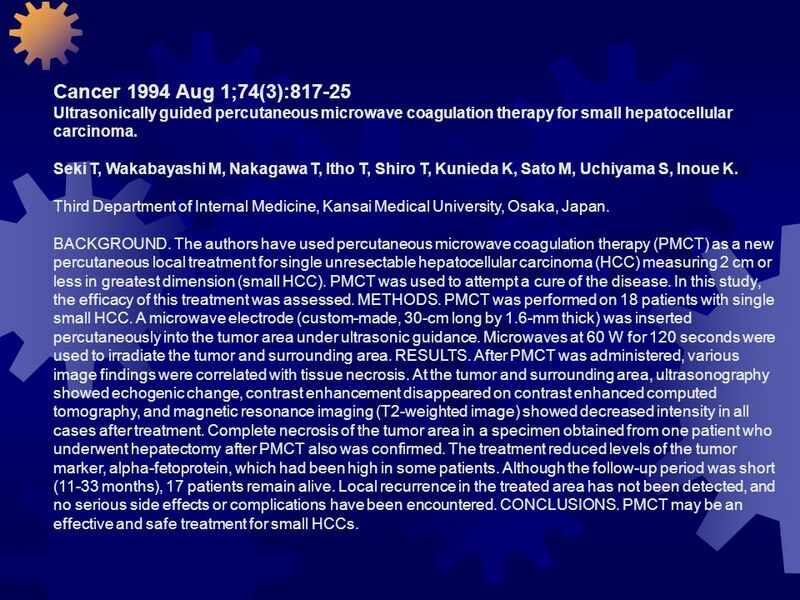 14 Cancer 1994 Aug 1;74(3):817-25 Ultrasonically guided percutaneous microwave coagulation therapy for small hepatocellular carcinoma. Seki T, Wakabayashi M, Nakagawa T, Itho T, Shiro T, Kunieda K, Sato M, Uchiyama S, Inoue K. Third Department of Internal Medicine, Kansai Medical University, Osaka, Japan. BACKGROUND. 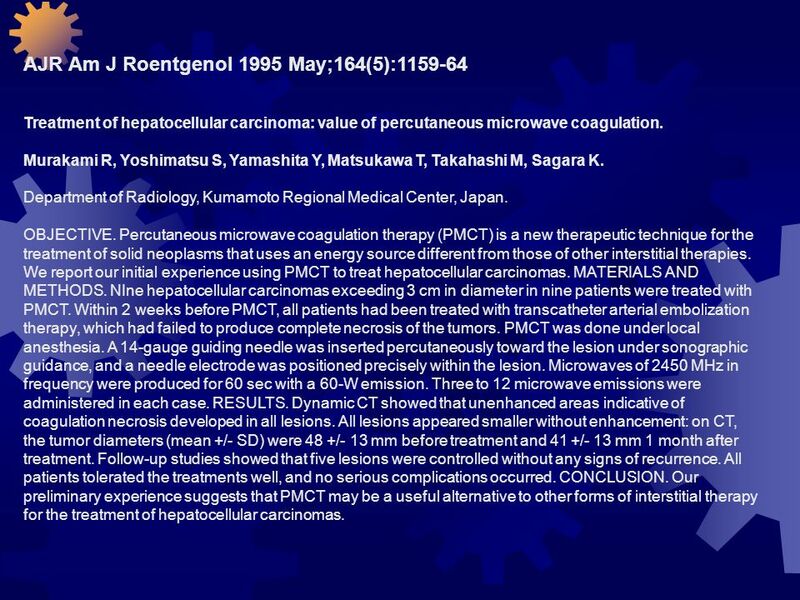 The authors have used percutaneous microwave coagulation therapy (PMCT) as a new percutaneous local treatment for single unresectable hepatocellular carcinoma (HCC) measuring 2 cm or less in greatest dimension (small HCC). PMCT was used to attempt a cure of the disease. In this study, the efficacy of this treatment was assessed. METHODS. PMCT was performed on 18 patients with single small HCC. A microwave electrode (custom-made, 30-cm long by 1.6-mm thick) was inserted percutaneously into the tumor area under ultrasonic guidance. Microwaves at 60 W for 120 seconds were used to irradiate the tumor and surrounding area. RESULTS. After PMCT was administered, various image findings were correlated with tissue necrosis. At the tumor and surrounding area, ultrasonography showed echogenic change, contrast enhancement disappeared on contrast enhanced computed tomography, and magnetic resonance imaging (T2-weighted image) showed decreased intensity in all cases after treatment. Complete necrosis of the tumor area in a specimen obtained from one patient who underwent hepatectomy after PMCT also was confirmed. The treatment reduced levels of the tumor marker, alpha-fetoprotein, which had been high in some patients. Although the follow-up period was short (11-33 months), 17 patients remain alive. Local recurrence in the treated area has not been detected, and no serious side effects or complications have been encountered. CONCLUSIONS. PMCT may be an effective and safe treatment for small HCCs. 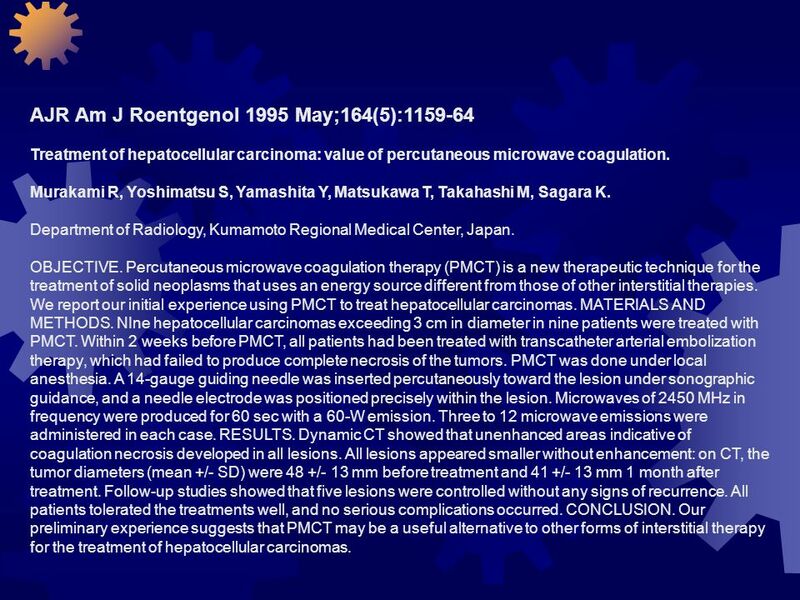 Treatment of hepatocellular carcinoma: value of percutaneous microwave coagulation. Murakami R, Yoshimatsu S, Yamashita Y, Matsukawa T, Takahashi M, Sagara K. Department of Radiology, Kumamoto Regional Medical Center, Japan. OBJECTIVE. Percutaneous microwave coagulation therapy (PMCT) is a new therapeutic technique for the treatment of solid neoplasms that uses an energy source different from those of other interstitial therapies. We report our initial experience using PMCT to treat hepatocellular carcinomas. MATERIALS AND METHODS. 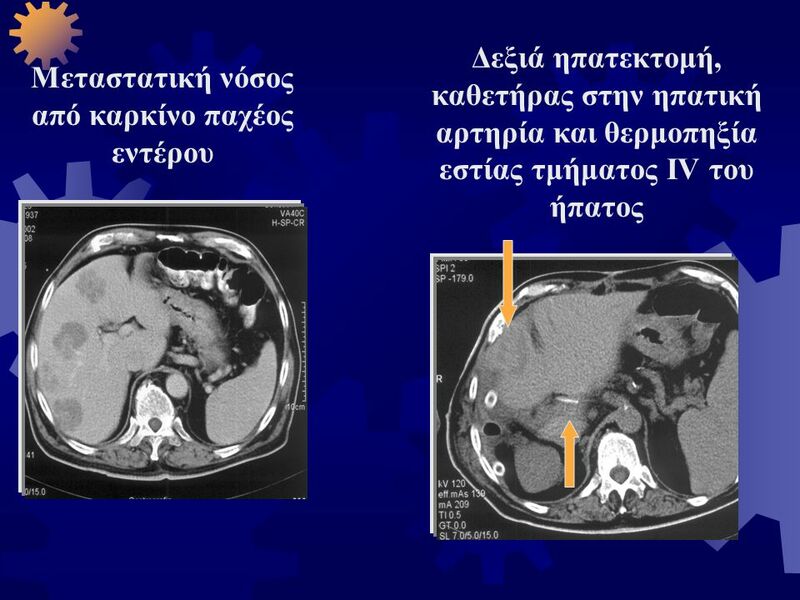 NIne hepatocellular carcinomas exceeding 3 cm in diameter in nine patients were treated with PMCT. 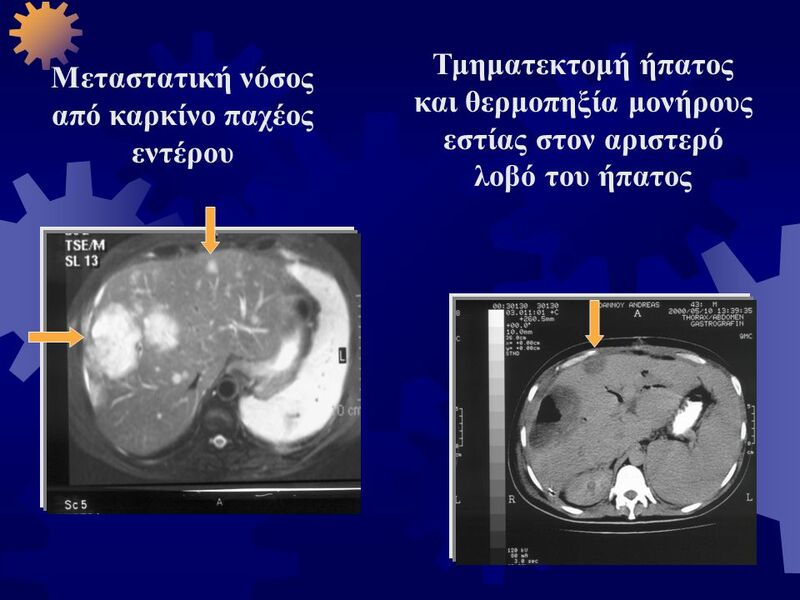 Within 2 weeks before PMCT, all patients had been treated with transcatheter arterial embolization therapy, which had failed to produce complete necrosis of the tumors. PMCT was done under local anesthesia. A 14-gauge guiding needle was inserted percutaneously toward the lesion under sonographic guidance, and a needle electrode was positioned precisely within the lesion. 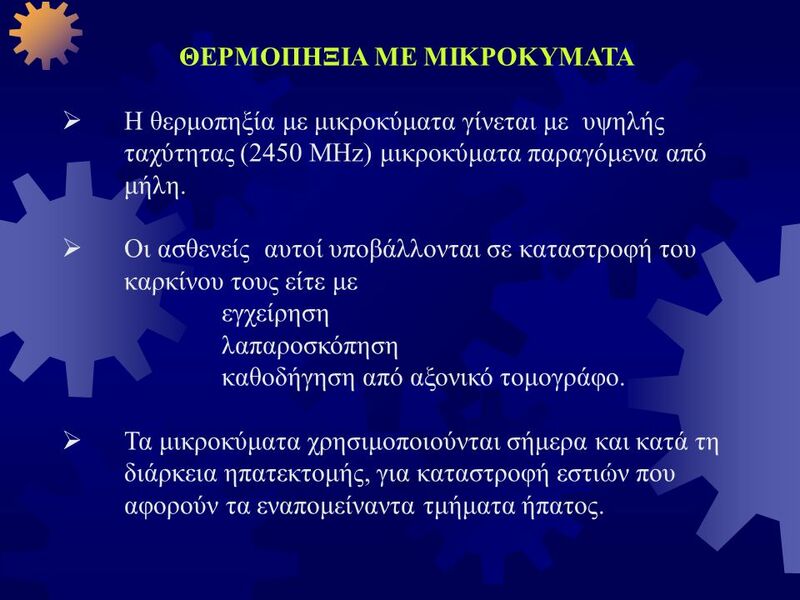 Microwaves of 2450 MHz in frequency were produced for 60 sec with a 60-W emission. Three to 12 microwave emissions were administered in each case. RESULTS. Dynamic CT showed that unenhanced areas indicative of coagulation necrosis developed in all lesions. All lesions appeared smaller without enhancement: on CT, the tumor diameters (mean +/- SD) were 48 +/- 13 mm before treatment and 41 +/- 13 mm 1 month after treatment. Follow-up studies showed that five lesions were controlled without any signs of recurrence. All patients tolerated the treatments well, and no serious complications occurred. CONCLUSION. Our preliminary experience suggests that PMCT may be a useful alternative to other forms of interstitial therapy for the treatment of hepatocellular carcinomas. B.­W. Dong, P. Liang, X.­L. 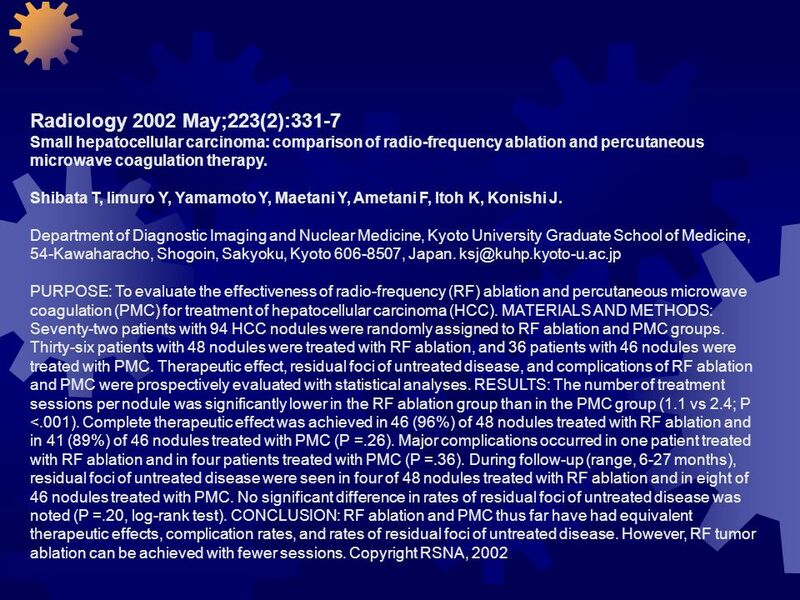 Yu, L. Su, H. Xin, S. Li Beijing/PRC Purpose: Percutaneous microwave coagulation was performed with a modified system in animal experiments and clinical study to evaluate this technique as a treatment option for liver cancer. Methods and Materials: In vitro study, the microwave electrode was inserted 5­6 cm into separated egg white, homogenate of pig liver and pig liver, respectively. In animal experiment, the sonographically guided coagulation was performed on 17 adult dogs. 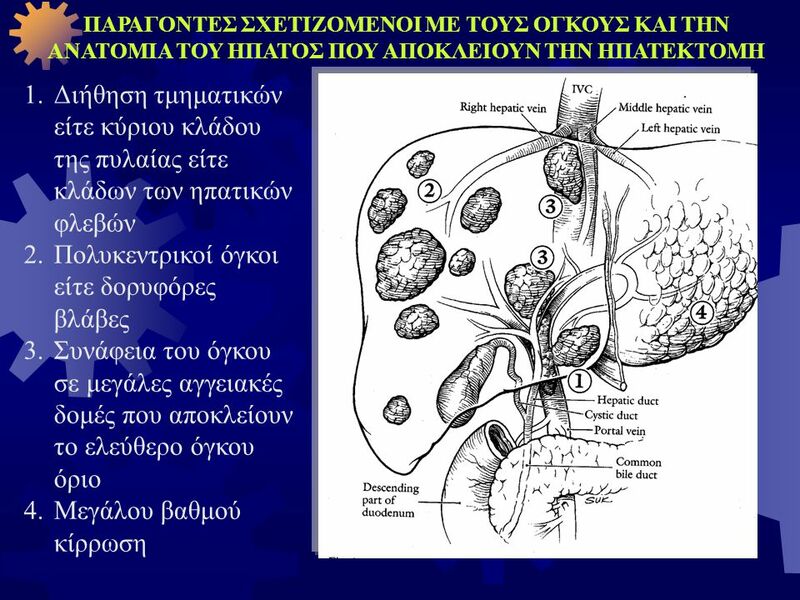 Clinically, 51 patients with liver cancer were treated. Results: Microwave coagulation at 60-Watt for 300 seconds produced a necrosis volume of 3.7 × 2.6 × 2.6 cm. The shape of the coagulated volume was ellipse when the exposed inner conductor of the electrode was 27 mm in 41 patients with hepatocellular carcinoma, 79% lesions became smaller, and the intratumoral blood flow disappeared in 89%. 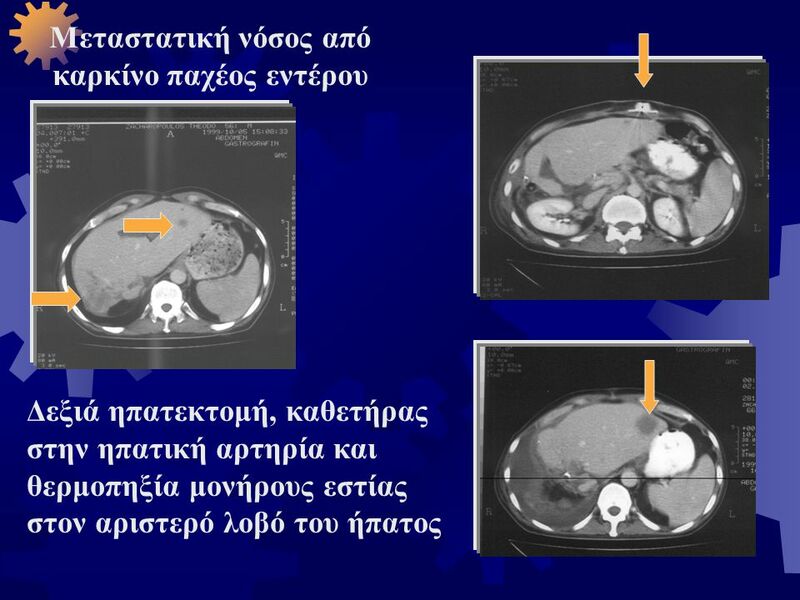 All tumors decreased density and 84% of them no enhancement on CT. Alpha-fetoprotein level was normal in 17/21. Repeated biopsy on 19 cases showed complete destruction of tumor in 18. In ten hepatic metastases cases, Shrinkage of lesions was 84%, the blood flow disappeared in 75% lesions. 73% of the nodules showed no enhancement. Repeated biopsy on six patients showed complete necrosis in five ones. 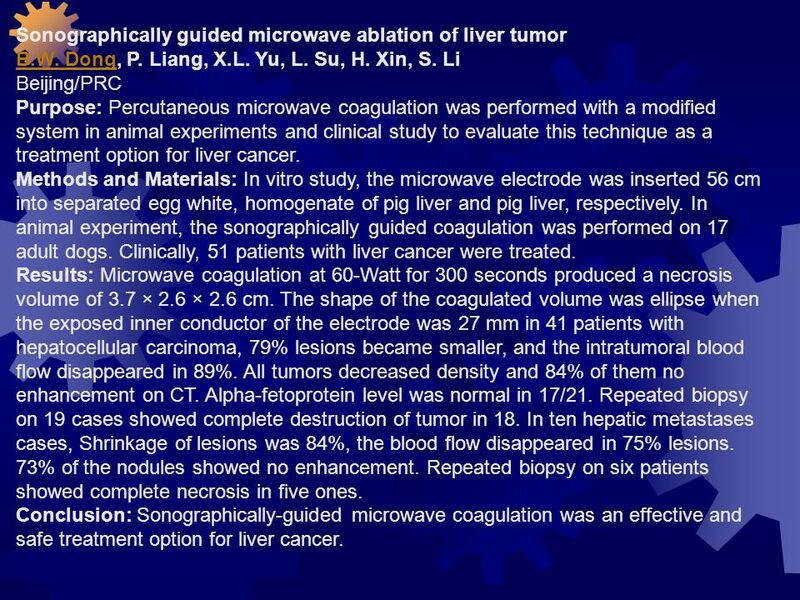 Conclusion: Sonographically-guided microwave coagulation was an effective and safe treatment option for liver cancer. 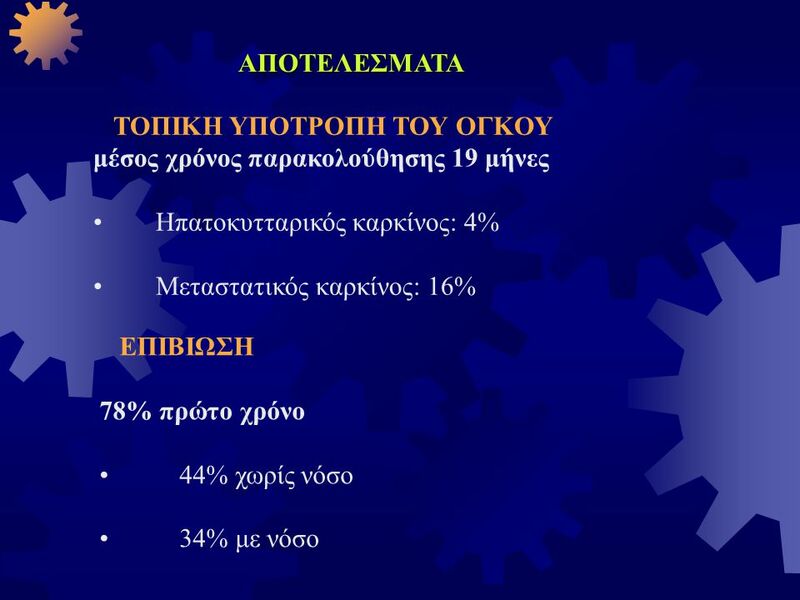 19 ΣΑΠΙΚΑΣ Ε. ΔΑΝΙΗΛ ΕΥΧΑΡΙΣΤΩ ΘΕΡΜΑ ΤΟΝ ΑΞΙΟΤΙΜΟ ΔΙΕΥΘΥΝΤΗ ΤΗΣ Γ ΧΕΙΡΟΥΡΓΙΚΗΣ, ΤΟΥ ΝΟΣΟΚΟΜΕΙΟΥ ¨ΕΡΡΙΚΟΣ ΝΤΥΝΑΝ¨ κ. ΝΙΚΟΛΑΟ ΛΥΓΙΔΑΚΗ ΚΑΙ ΤΟΥΣ ΣΥΝΕΡΓΑΤΕΣ ΤΟΥ, ΓΙΑ ΤΗΝ ΕΥΓΕΝΙΚΗ ΠΡΟΣΦΟΡΑ ΜΕΡΟΥΣ ΤΟΥ ΥΛΙΚΟΥ, ΓΙΑ ΤΗΝ ΠΑΡΟΥΣΙΑΣΗ ΑΥΤΗΣ ΤΗΣ ΕΡΓΑΣΙΑΣ ΚΑΙ ΕΡΕΥΝΑΣ. 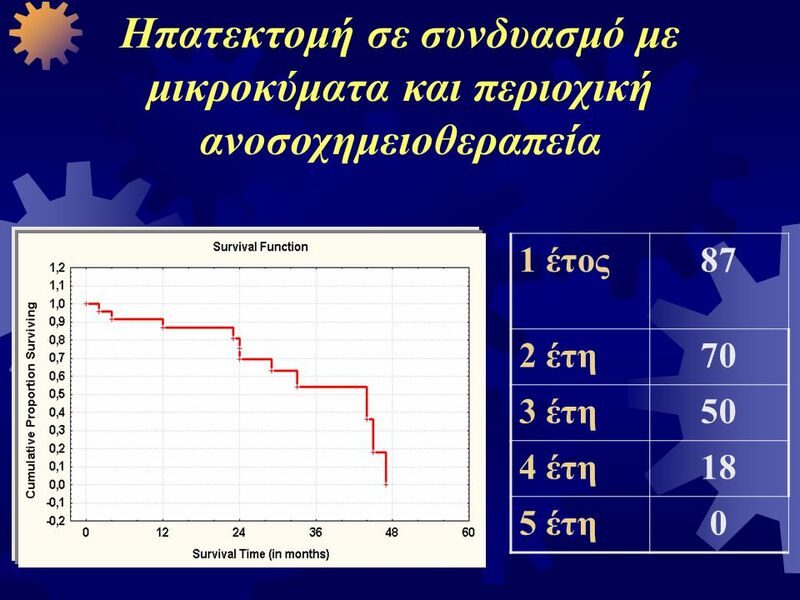 Κατέβασμα ppt "ΠΤΥΧ.ΘΕΟΛΟΓ. ΚΑΙ ΙΑΤΡΙΚΗΣ ΣΧΟΛΗΣ ΑΘΗΝΩΝ"
Η ΑΞΙΟΛΟΓΗΣΗ ΤΗΣ 24-ΩΡΗΣ ΔΙΑΚΥΜΑΝΣΗΣ ΤΗΣ ΑΡΤΗΡΙΑΚΗΣ ΠΙΕΣΗΣ ΑΝΔΡΕΑΣ ΠΙΤΤΑΡΑΣ MD. 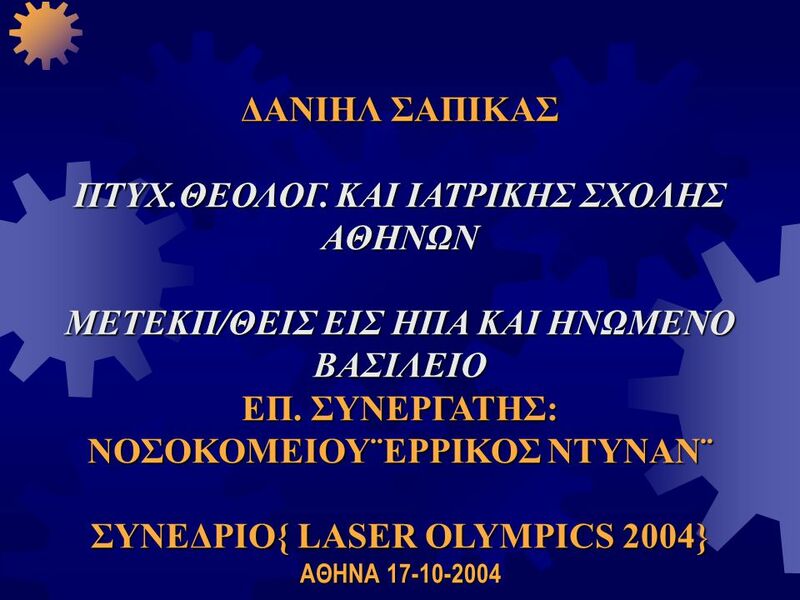 ΠΛΑΚΑ Η παλαιότερη γειτονιά της Αθήνας διατηρεί τα ίχνη της μακραίωνης ιστορίας της. 2006 GfK Praha 140.256CORRUPTION CLIMATE IN EUROPE 81 - 90% 71 - 80%61 - 70%51 - 60%0 - 10%11 - 20%21 - 30%31 - 40%41 - 50% 91 - 100% ΚΛΙΜΑ ΔΙΑΦΘΟΡΑΣ Η.